We’ve got an exciting and feature-packed update in the world of ubiCabs for you. Read on to find out how these improvements and new features will benefit you. The ubiCabs invasion has begun! In the past few weeks we’ve extended our coverage from London to include Bournemouth, Cardiff, Edinburgh, Glasgow, Leeds and Manchester. 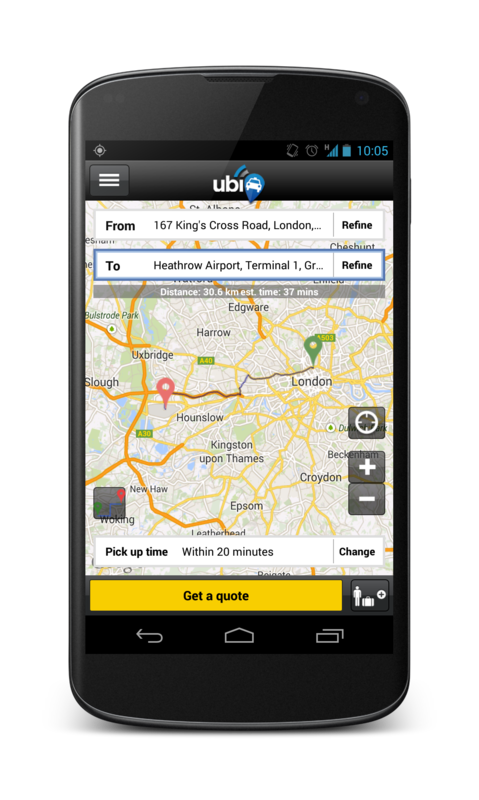 So whether you’re a local, a tourist or perhaps a visiting sports fan, you can rely on us to get you around the airports, centres, stations, and stadia of these new additions to our ubiMap of the UK. We aren’t stopping there, however, so keep up to date with our website, follow us on Twitter and like our Facebook page for info on other areas we’re getting to in the near future. Our referrals system has been updated to save you money! You can now earn credit by referring your friends. 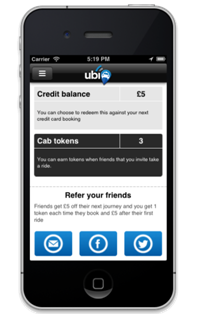 When your friend takes their first ubiCab we give them £5, and just to be fair we give you £5 too, to be redeemed against future bookings. What’s more there’s no limit to how many friends you can refer, so it’s a case of the more the merrier (or the more the cheaper, but that doesn’t have quite the same ring to it). Just open up the menu in the top left of the app screen and tap ‘Cab Credit’ to get started. You can pick friends from your address book, spread the word on Facebook or send a Tweet. We’re also rolling out our brand new tokens system so that you can benefit from any other trips your friends take. These tokens will appear in your account each time your friend makes a journey and a token can be used in conjunction with your credit/account and card payment to make your journey even cheaper. We’ve reduced the number of steps from entering your pick-up and drop-off points to getting your quote and streamlined the process so the interface is now crystal clear and lightning fast. The newest update has come hand in hand with an updated version of Google maps, making the drag and drop pin feature the most accurate yet, as well as making it easier to see when you’ve got the right address when zoomed in. The feature for refining the pick-up and drop-off addresses has been made easier to access so you can make sure your cab arrives exactly where you want it to, with the option to manually enter the house number or add extra details. For example ‘please wait outside the green double gates’. Algorithm thingies have been updated, or perhaps something else has… Suffice it to say, technological wizardry has been employed and you reap the rewards. 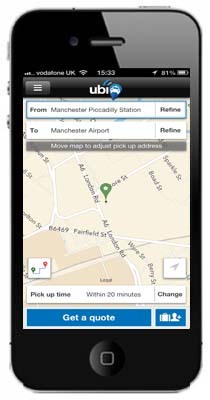 The results you get when you type in a postcode or address have been optimised so that you can choose your destination more quickly and with more ease than ever before! Just as with the Android app, the ability to fine-tune your address has been made even clearer, meaning you can give precise directions and make sure your driver can find you even if you’re hanging out under your invisibility cloak. With the improvements we’ve been making to our systems and the new cities and towns on our roster, now is the perfect time to try out our iPhone & Android apps or website. Remember to rate your cab and company whatever your journey was like; this will help us to maintain the high levels of service that we set for ourselves and our partner companies. Or email us on support@ubicabs.com if you have any questions.